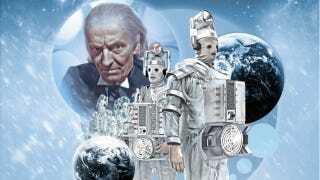 Almost everyone knows how the Doctor Who story "The Tenth Planet" ends — it's the last story where William Hartnell plays the mysterious time-traveling Doctor. Except that a newly unearthed draft script by Kit Pedler and Gerry Davis leaves out the Doctor's regeneration. Instead, the climax of the story is much more about the Doctor and Polly being held aboard the Cybermen's spaceship, where the Cybermen plan to convert them into Cybermen. Michael Seely, who's publishing a biography of Pedler called The Quest for Pedler, found this script along with some early drafts of some episodes of "The Moonbase" (originally called "Return of the Cybermen") and Pedler's TV show Doomwatch.